Walmart Inc. has expanded its real estate interests in Bentonville beyond the western boundary of the future location of its new headquarters. The retailing giant has invested more than $18 million along the west side of J Street in the months leading up to and since the new home office news. “We want to create a different work environment, so that people can work together in an agile fashion,” said Walmart CEO Doug McMillon, when plans for a new home office were revealed on Sept. 15, 2017. “This is a little bit of another stake in the ground to say this is a company that’s going to be here in 50 years time or more. At times, Walmart has acquired property in the J Street corridor in its own name, one of its subsidiaries or a limited liability company. LLCs were deployed to purchase property along the west side of J Street. 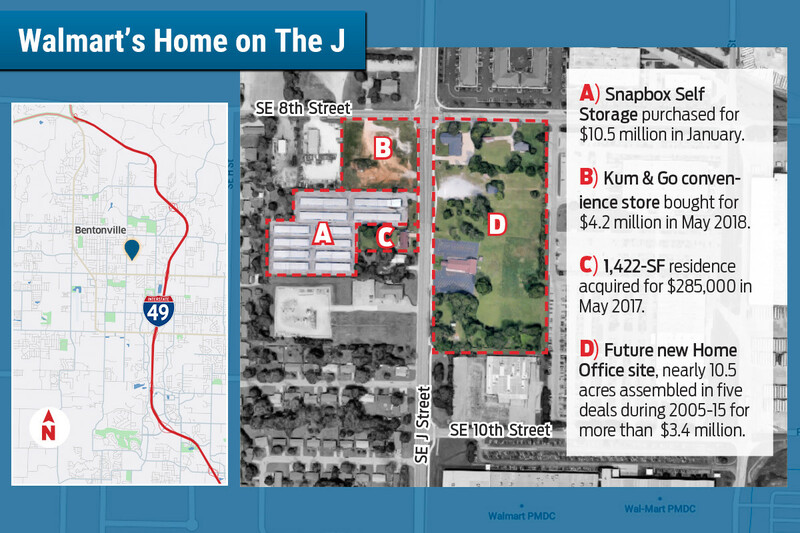 When Walmart set its sights on buying the Snapbox Self Storage project at 804 SE J St., the transaction turned into a multi-property deal that included two mini-storage projects in Little Rock. Philadelphia’s Self Storage Capital Partners agreed to sell the 4.3-acre Bentonville development for $10.5 million — but only if Walmart also bought the 376-unit project at 8015 Geyer Springs Road for $3.2 million and the 562-unit project at 6100 Leon Circle for $2.1 million. The series of buys closed in January. The mini-storage transactions followed the $4.2 million purchase of the Kum & Go project at 800 SE J St. last year and the $285,000 acquisition of a 1,422-SF house at 902 SE J St. in 2017. The home site is among a string of 12 residential purchases along the west side of J Street between Eighth and 14th streets made between May 2017 and January 2018. The acquisitions totaled almost $3.7 million. Houses have been demolished, and home sites have given way to green space since the change of ownership. In advance of developing its new home office, Walmart added to its holdings on the east side of J Street as well. A nearly 10.5-acre tract at the southeast corner of J and Eighth streets was put together to round out a large swath of company-owned property. “That is part of their bigger plans that haven’t been submitted yet,” said Shelli Kerr, planning services manager for the city of Bentonville. The property, formerly home to three houses and two churches, was assembled in five transactions totaling more than $3.4 million during 2005-15. The land completes a 114-acre block of Walmart-owned real estate east of J Street between Eighth and 14th streets.